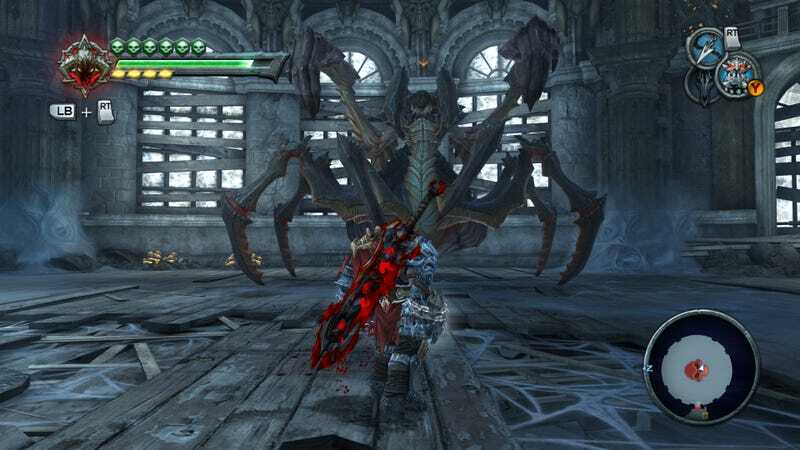 Wow, eleven hours in to Darksiders and I'm not the least bit bored. I've found that over 8 hours in games starts to fatigue me now. Maybe it is impatience that somehow comes with age and gaming, but I think it is really a more refined bullcrap detector for padding. Honestly, it is probably a mix of the two. As I age, I find less and less time for gaming, so my time for it becomes more and more precious. This can make things like Skyrim a hard undertaking; devoting 220 hours to one game seems like a lifetime commitment. What I have really started to dislike is padding. I begin to loathe games that are obviously padding length by making me redo big chunks of the game over again. Skyward Sword was the worst offender at this in recent memory...my wife still moans about wanting the 50+ hours back from playing Skyward Sword. Now, I don't expect Darksiders to take nearly that long, if I were to guess I would say I'm likely over the halfway point in the game (though it could go on and on, I don't really know). So far though, it has been a tight and extremely well designed ride. I've never been bored, I don't feel like there is much repetition and the gameplay is mixed up very well. The new weapons and abilities are extremely well paced as are the changes in the different environments. I love when a game is designed to give you a complete and concise experience. Sure, there is some extra exploration if you want to be a completionist and some extremely hard chests to track down, but overall the pacing is really superb. It always leaves me with excitement for what's next....something many games have lost sight of for the sake of making their worlds feel big and their games long. I also played some more Lara Croft And The Guardian of Light last Tuesday with my friend. Man, this is SO the way to do these games. I've enjoyed this a billion times better than any Diablo-style game. I don't want to disparage anyone's tastes, but I just don't understand the appeal of PC based Diablo-like dungeon crawlers. There seems so little in the way of a "game" to me. Granted, they are just really not my type of game. Loads of loot to be sorted and large inventories and skill trees to be managed is really the bulk of the "game" in these types of games and I really REALLY dislike those aspects in most games. However, in the PC mouse/keyboard controls for these games I really feel a disconnect with my character. Clickity-click combat really doesn't do it for me, I feel like I have so little input. Once you give these games a controller instead of a mouse and keyboard, it really adds so much in the way of excitement to the controls. I suddenly feel like I am controlling my character. So, LC: GoL really is the perfect game for me. Co-op? Check! Little inventory to manage? Check! Exciting controls? Check and double-check!! The controls are just fantastic for this type of game and the platform elements mixed with the dual-stick combat makes for such and engaging game. This format could be easily adopted for a full Diablo-style game and I think there would be a large audience for it. I know I am not alone in my displeasure at the standard clickity-click dungeon crawlers. So, that was my excitement for the week in gaming and I hope to get a lot more Darksiders in this weekend. What are you playing this weekend?